The flyer contains multiple inaccuracies about proposed legislation to decriminalise abortion. The mother of a federal Liberal National Party member in Queensland has used her son's parliamentary office and email to distribute anti-abortion propaganda. Federal member for Petrie Luke Howarth's mother Denise used his electorate officer's computer and email address to send a flyer to a constituent. 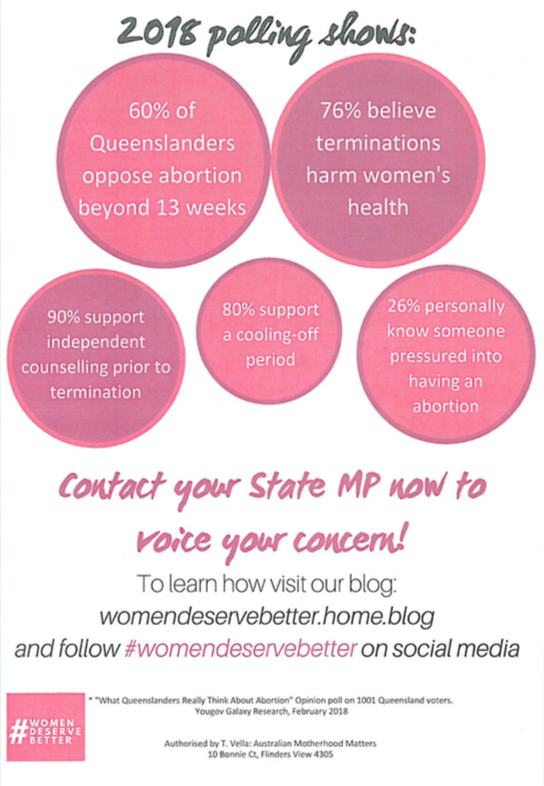 Denise Howarth writes that she is planning on letterboxing certain electorates with her flyers, which she attaches, ahead of next week's debate on a bill introduced by the Queensland Labor government to decriminalise abortion. "Here is a copy of the flyer I am delivering to Aspley and Bald Hills area targeting Bart Mellish the Labor state member of Aspley," she wrote. Luke Howarth, who liked multiple tweets from people marching for abortion to remain a crime last month, did not answer questions about why his mother was using his parliamentary resources. “I am strongly opposed to [deputy premier] Jackie Trad’s extreme abortion laws," he told BuzzFeed News in a statement. "Many MPs have volunteers who assist in their offices and are also active members of their communities. Forwarding information to a constituent, who called to request it, is part of my job as the local representative." He did not respond to questions about whether his mother also used his office to print the flyer, or whether he was personally involved in the campaign against this proposed state legislation. He did not indicate whether the electoral officer had any idea their email was used to distribute anti-abortion flyers. His mother spelled abortion "aportion" in the subject line and in the email itself. 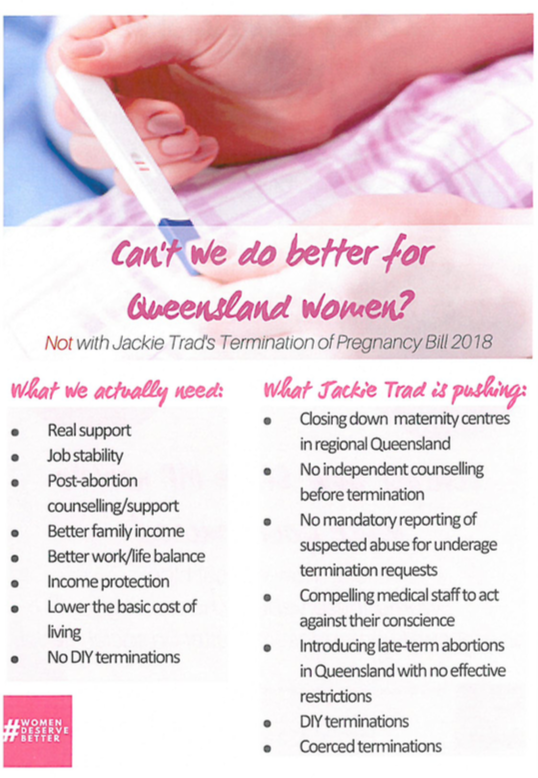 The flyer makes false claims Trad's legislation would close down "maternity centres in regional Queensland", introduce "late-term abortions in Queensland with no effective restrictions", and result in "DIY terminations" and "coerced terminations". It also falsely claims that there would be no independent counselling before terminations and that medical staff would be compelled to "act against their conscience". The proposed legislation includes a provision which requires doctors who conscientiously object to abortion to refer to a medical practitioner who does not. The flyer redirects people to this website. "Welcome! If you’ve found this site that means you received one of our flyers in your letterbox. Awesome!" the website reads. It says the organisation is a "group of mothers based in Brisbane". It also redirects people "contemplating abortion" to pro-life counselling service Priceless House. This isn't the first time Howarth's mother has been involved in her son's political campaigning. During the 2016 Federal election campaign she handed out how-to-vote cards outside a pre-polling centre in Petrie. “You will not find a harder working MP than Luke,” she told Crikey. “I mean, I am his mother, but people here notice that he’s in the community." There are several different flyers being letterboxed to residents around Queensland ahead of next week's vote on the bill. Last week a Brisbane mother told BuzzFeed News about her anger when her four-year-old daughter returned from the letterbox with a graphic and medically inaccurate flyer. "The Queensland [Annastacia] Palaszczuk Government wants to make any type of abortion up to 22 weeks legal for any reason," the pamphlet read. In fact, the law would move the procedure from criminal to health legislation, where it would be available to a woman up to 22 weeks gestation, after which she would require two separate doctors to approve the procedure.